Service rating : Both Chan and Kevin were really professional friendly and reliable. I am really pleased with the quality and value. Chan offers sound advice to ensure the correct style and blinds being fit for purpose. Kevin fitted the blinds in no time with no mess! I would recommend to everyone! Service rating : Excellent service from Chan and Kev from start to finish. I will definitely use and recommend Colourblinds again. Product : Not too sure why we had to pay for the diamond drill bit for porcelain tiles, surely this should have been absorbed in the price? Service rating : Excellent and professional service from start to finish. Would highly recommend and will certainly choose Chan and his company to fit any future blinds. Product : Superb selection and quality of blinds to choose from. They were made to measure and fitted perfectly. An efficient and professional service throughout. Thank you. Product : The Blind was top notch for a good price, with a good install. 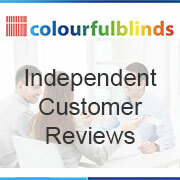 Service rating : Excellent service by colourful blinds, Chand and Kevin were excellent throughout. Highly recommended!!!! Service rating : Would definitely recommend colour blinds. Chan did a great job at installing some blinds for our bi- folding doors that meets our needs. He was very honest about the capabilities of the blinds and any issues we could potentially encounter and installed on time as promised. Product : Very happy with our blinds, they look great! Service rating : Service was great. There was ample choice and the fitter was very thorough and careful. Product : The main blind we chose was battery controlled. This was a very recent purchase so it’s too early to comment in detail but everything ok so far. The quality is good so I don’t expect any problems. With tpbattery operation the upper and lower blind positions are automatic but the blind can be stopped at any point. Service rating : I had kitchen roller blinds fitted and when fitted I wasn't happy with one of the windows colourful blinds couldn't do enough to make me happy it wasn't even their fault my ceiling wasn't straight but they wouldn't leave until they solved the problem. Such friendly helpful service would definatly recommend them. I would like to thank you for taking the time to write this review, i am happy that you like our blinds i have yet to install your second round of blinds which i will be their on Monday. Thank you for writing this product review and i am happy that you liked your perfect fit day and night blinds, we are getting very good feedback on these blinds and i feel very confident that these blinds will work very well for your entire house by allowing you to see out with your day blinds and provide you the privacy with your night blinds. See you Monday. I would like to thank you for taking the time to write this review and happy that you like your new blinds, i would like you wish you all a Merry Christmas & a Happy New Year. Fantastic service. Can’t fault them. I couldn’t notice any obvious flaws but they changed 2 of my blinds as he wasn’t 100% satisfied with the way they were sitting. The quality of their blinds are fab and selection they have is great! I would like to thank you for taking the time to write this review, I am happy that you like your new Motorised Roller blinds and wish you, your husband and family a Merry Christmas & a Happy New Year. Look forward to working with you again in the near future. Thank you for taking the time to write this review, i am happy that you like our service for the installation of your blinds and we were very happy to meet you again to install blinds in y our new home. I would like to congratulate you in the purchase of your new year as well as wish you a Merry Christmas & a Happy New Year. I am happy that you like the roller blinds installed in your kitchen and bathroom, look forward to working with you again in the near future. Service rating : We have used this company before for a much larger order. This recent order was only for a couple of rooms but in spite of the small order we still received the same efficient service. Product : The blinds are good quality with a very neat fitting. it was nice working with you again to supply you vertical blinds for your bedrooms, i am happy that you like the service offered and look forward to working with you again in the near future. I would like to wish you both a Merry Christmas & a Happy New Year. Thank you for taking the time to write a blinds product review, i am happy that you like the quality for the Vertical Blinds installed. Service rating : Absolutely love our new blinds. We needed them fitted quickly for an event and they were able to fit us in and get them up in time. The fitter talked us through the different options when installing and he was very neat and tidy, cleaning up after himself after the job. Blinds look great! Product : Good quality and look great! Thank yo for taking the time to write this review, it was nice to meet you both again for the installation of your new blinds, i will also let our fitter know about your feedback. I would like to wish you both a Merry Christmas & a happy New Year all here from Colourfulblinds. Service rating : Excellent service and quality. Blinds manufactured very quickly and fitted promptly with the minimum of fuss. Product : Excellent quality and fitting. Service rating : I'm very impresses with the service and my blinds. Product : I am happy with the vertical blinds I had fitted and the good service. Thank you for taking the time to write this review it was a pleasure working with you to finalise the type and colour of blinds for your living room and bedroom. Thank you for taking the time to write a product review on the blinds, and am happy that you like your vertical blinds. Recommended by our neighbours, we were delighted with the enthusiastic,but not pressing initial visit and explanations. There was plenty of communication;therefore we knew exactly when and what was occurring. The installation itself was non invasive and quick. There followed a detailed explanation of how to use and maintain the blinds. Thank you for taking the time to write your feedback, i am happy that you are liking your new perfect fit blinds for your conservatory and that you can now use it properly and also maximising its space. Maybe you have all the furniture in now, if you do get a chance do send us some photos. Service rating : Chan was great! With a number of samples, some good conversation and decisions made within 1 visit, 7 days later the blinds were installed professionally and the rooms were left in a very clean state as if there wasn't even a drill in sight! Chan listens, understands and advises on the best approach to dealing with having your windows covered up. Product : Love the blinds, they have already made a great difference to the rooms they were installed in. Thank you for taking the time to write this review, it was nice speaking to you about your requirements for blinds, as well as it was my first job in Maidenhead. Congratulations on the purchase of your new flat i am happy that you like the finish of your new vertical blinds. I feel it was the best decision on going for Vertical Blinds, standard for the living room and blackout for the bedrooms. Also as you are looking to rent the property it will be easier for you to change the vertical slats in the future with minimum investment. Look forward to working with you again in the near future.